She was a Millersville alumnus. She was hired by the CIA to work on mainframe computers. In the 1980’s she assisted her husband in removing Soviet-planted bugs in a U.S. Embassy. Diana Lin Durand lived an exciting life, but it was ended by an 18-year battle with breast cancer. Now through the efforts of her brother, Dr. Dennis Denenberg, Millersville University is hosting an event to educate the campus on the disease that ended Durand’s live. 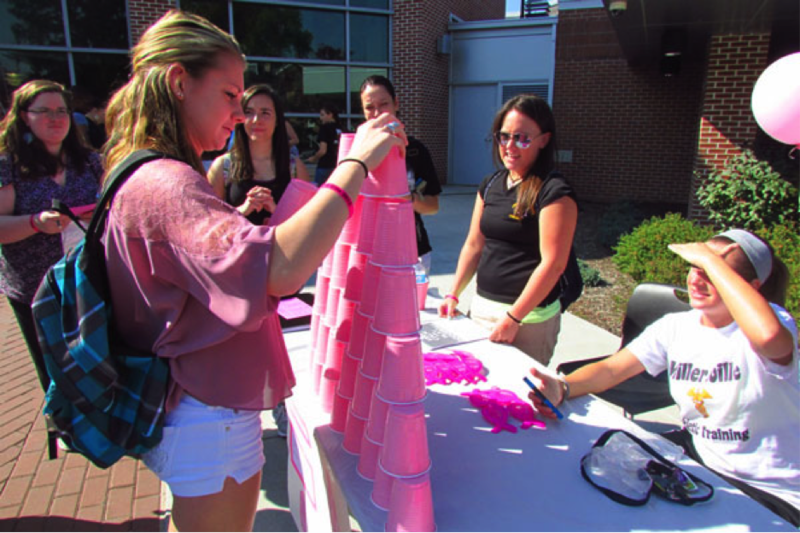 The Breast Health Initiative of Millersville University, founded by Denenberg, is hosting the fifth annual Breast-a-Ville, on Oct. 7 at 10:30 a.m., at the Student Memorial Center (SMC) Promenade. The theme for this year is “Know Your Family History.” It will focus on the genetic aspects of breast cancer and encourage students to uncover their family history. There will be various interactive games and activities to spread awareness about breast cancer. Vendors that will be present at Breast-a-Ville will include: The Pa. Breast Cancer Coalition, Grace Cancer Care and The Penn State Breast Center. According to the Center for Disease Control and Prevention, breast cancer is the most common cancer in women, regardless of race or ethnicity. It not only effects women, but can directly effect men. In 2012, 41,150 women and 405 men in the U.S. died from breast cancer. Early detection and understanding family history saves thousands of lives each year, because it is detected before it spreads or becomes more dangerous (www.cdc.gov). Denenberg has expanded his efforts on bringing awareness to breast cancer at Millersville University, through an established endowment named Diana’s Dreamers: Determined to Defeat Breast Cancer, they are hoping to establish online chapters on every campus in the U.S. to promote breast cancer awareness and a spirit garden statue located at Millersville University’s Stayer Hall. Along with Denenberg’s efforts, Dr. Richard Freriches, professor emeritus is honoring his wife Marsha. The Breast Cancer Awareness Initiative established The Diana & Marsha Breast Cancer Awareness Center Resources, located on the second floor of Health Services. The center provides resources for women including information on prevention of breast cancer, early detection, diagnosis, treatment options, emotional impacts and nutrition.